To have head-knowledge of faith in God is one thing, but truly believing it with our hearts in a completely different thing. I've always known God loved me. Known He was good and that he sent Jesus to save us. But I have known it with my head most of my life. To know this with every ounce of my being has proven to be a very difficult thing. So when a book entitled "Fierce Faith" is brought to my attention, I had to scoff a bit. Feeling like my faith barely made the cut in the first place (on a good day) how could I live with a faith so strong it was fierce? 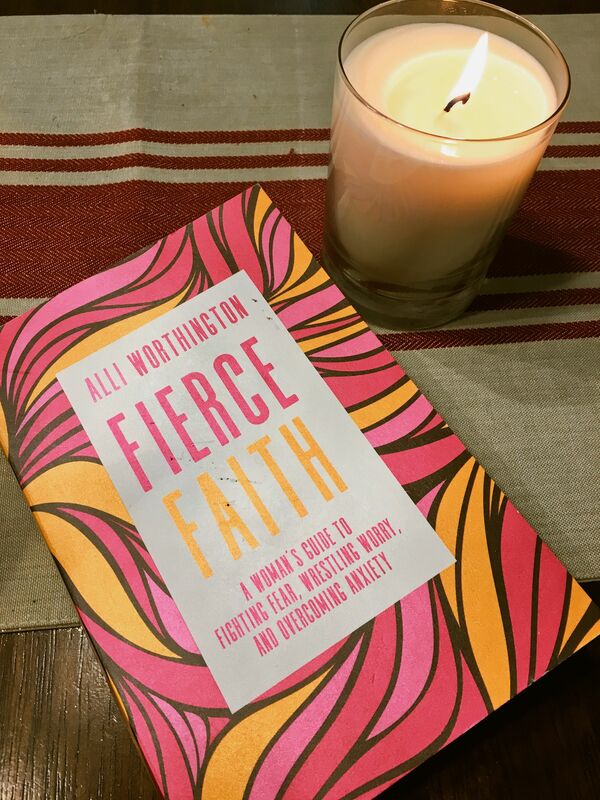 Alli Worthington intrigued me with this book's title and quite honestly, I had already begun another book prior to this, but was having a very hard time "sinking my teeth" in to it and felt I was being led to put it down and try a different read. I have firmly found and believe in the Holy Spirit's leading when it comes to my personal and spiritual growth. Every time something doesn't connect, I feel that still, small and gentle voice say, "It's okay Morgan, don't force it, I have something better for you" and sure enough I picked up "Fierce Faith". This book: another step, another walk, another door on my journey to being a refreshed person and believing the things that God says are true about me. This book begins on the topic of fear. And how we can be "completely bound up by fear and worry". And this has been me. It has been my life for a very long time. So long in fact I felt like it was normal and was just going to be how my life was forever. And by this point I was only on page 14! Page 15 just confirmed that this was exactly the book for me at this point in my walk. Alli says,"I've seen God provide manna in the midst of famine after famine in my life. I know he provides. I've seen him do it over and over again, but despite all that, I was full of fear. People often told me I am fearless and brave and confident, but that's the armour I've always put on to convince myself that I am. The reality is that for most of my life, I avoided what made me feel uncomfortable and ran away from what made me worry. I lived my life frozen in fear, weighed down by worry and absorbed in my anxiety." Guys, this may as well have been me writing that- word for word. She literally was describing something in myself, that I didn't know how to verbalize. I felt like I could be knocked over with a feather. That was how shocked I was! And from that moment, I was hooked and gobbled this book down. Pages, binding and ink! Alli not only helped me to give a name to my feelings but also how to stand and fight for something better. She speaks on having a "Battle Plan" in place to help us fight the good fight against the enemy of our souls. She literally goes through chapters, 12 in fact, tackling our fears as women. The fears we have surrounding rejection, of not being enough, failure, and betrayal just to name a few. And each one resonated with some part of me. I had connection to every single one of those fears. And to carry that around still, after all that I have seen Jesus do in my life, made me realize, that I have only been truly believing what God says about me in my head. My heart was still so broken and had so many walls. Even walls, I thought I'd done a pretty good job working through already. But there they were again, popping up. It's a funny thing, the walls or armour that we build around ourselves. The ones we begin when we receive our first hurtful comment, first fight, first broken heart, etc. And slowly, quietly they climb taller than perhaps we ever meant for them to be. And they cut us off from true relationships, fellowship and love from the people around us and worse, that beautiful relationship we could have with our Lord and Saviour, Jesus Christ. So, here I am now, still broken but having found and am walking through another door to becoming more like Jesus, always in progress by the way, as it's about the journey and the choices I make each day. I am finally feeling like my walls are a bit shorter than they were. And I know that today, I am better than I was a week ago. And all I hope to do is continue to have that perspective. Not for perfection, as God does not seek that from me, but that I try. That I love. And that I am always in relationship with Him. I was so thankful for this book!